Pork tenderloins were on sale at the grocery store – a three pack for around $10 – so into the cart they went. I usually turn pork tenderloins into an Italian roast pork called porketta but I was feeling like trying something new so I went looking for options. 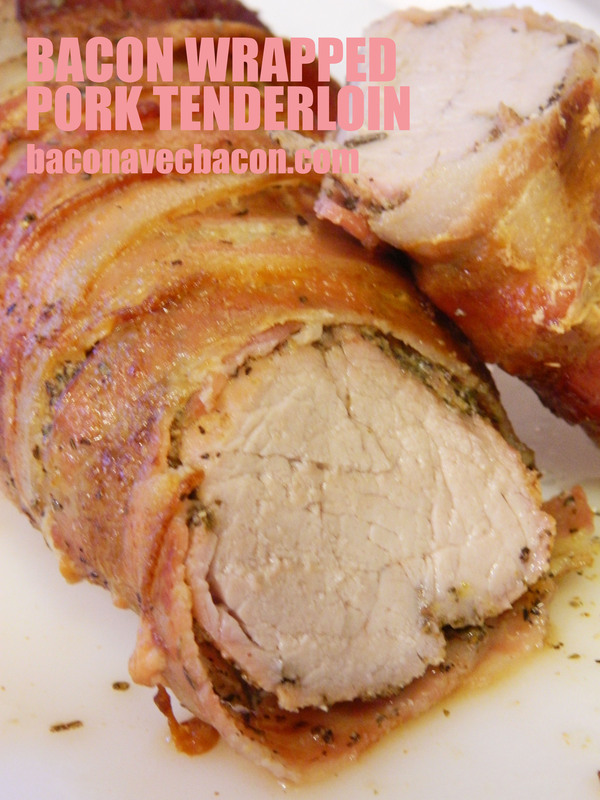 A friend suggested this recipe for bacon wrapped tenderloin. It had bacon and it seemed so easy that I actually had Mr. Bacon handle cooking duties. Everything with bacon has to be good, right? Well, this was really good. Insanely good in fact. Probably because he wrapped the tenderloin with 10 strips of bacon, when the original calls for three. He also omitted the olive oil by mistake but given that it’s wrapped in bacon, I don’t think it needs it. Mix the spices in a ziplock freezer bag and throw the tenderloin in. Shake and press into the meat. Wrap liberally with bacon, securing it with toothpicks. Place in a 9×13 pan an roast at 400 degrees for 45 minutes to an hour. Remove from the oven and let it rest for 10 minutes before slicing. Try to resist the urge to eat the entire tenderloin between two people. Seriously. We thought about it but decided that would be ill advised.